As you may have read, in 2017 I started a bullet journal just for my reading. I was a bookseller at the time and spent more of my reading time trying remember what was good so I could recommend it to customers. 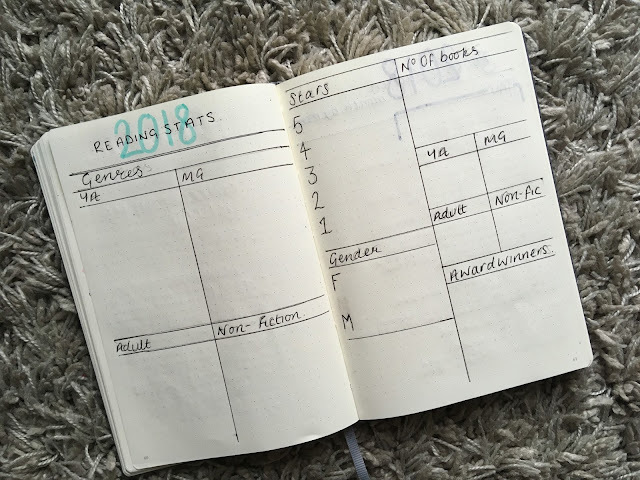 I thought that starting a bullet journal just for reading would be a great resource for the things I loved. Since leaving Waterstones, I've kept it up and it's inspired me to keep reading and enjoying new books. With the start of 2018, I realised I needed to create some new overview pages to keep track of my reading. 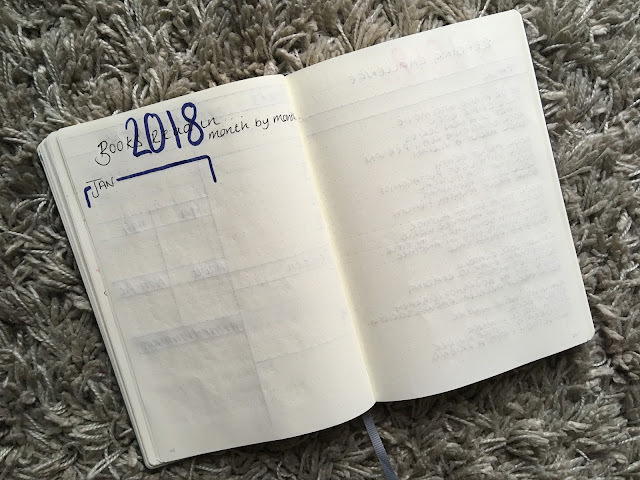 I'm using the same bullet journal that I used last year (a grey dotted Leuchtturm 1917) and going to lay it out in a similar way to what I did last year. I loved the reading stats that I did last year, but realised that I needed to make a few tweaks to get things better for me this year. I needed more space for the genres of books and decided that I wanted to split the categories up even more. Last year I had two spaces for adult and YA, so this year I've added in non fiction (in the hope I will read more!) and middle grade, to help with the kids books I read. One of the categories I loved on last years spread was the gender category. While I'm all for reading whatever takes my fancy, it was surprising to see I didn't read many male authors last year. I'm going to try and push myself a bit more this year so this category was staying. I've also broken down the number of books section into an overview, then the respective genres so I can see where my reading pattern lies. Finally I've added award winners. I wanted to try and read a few this year and thought this would be a fab place to jot down the awards I've ticked off. I decided to do the exact same set up as last year for the book lists. I loved the monthly boxes as it really looked like a gorgeous page at the end of it. It was also great to see the reading trends and the amount I read each month too. I'm going to try and give this years colours a bit of a theme (thinking purple/blue/pink and grey). I try not to spend too long on this page, only because I would rather spend time creating nice pages for the reviews than the monthly overview! Finally I wanted to try something different. Now my job wasn't one that revolved around reading the new books, I wanted to attempt a reading challenge. I spent ages scouring the web to find one that worked for me and settled on a condensed and amended version of the Pop Sugar reading challenge. 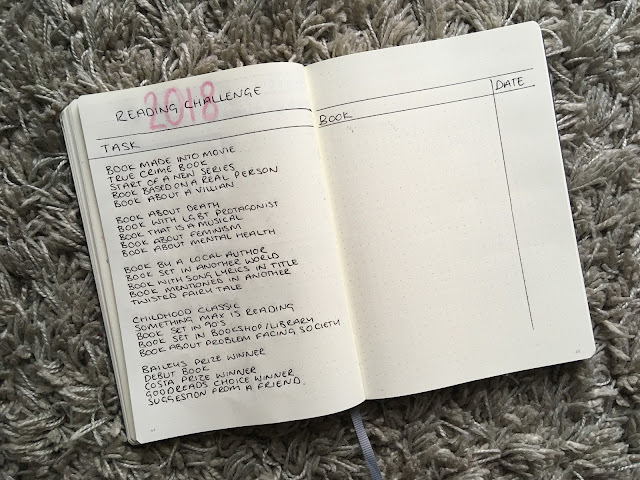 I tend to read about 50+ books a year and whilst their list was 40+, I wanted to give myself time to pick what I wanted alongside ticking a list off. With 25 tasks to complete, I can't wait to get started.